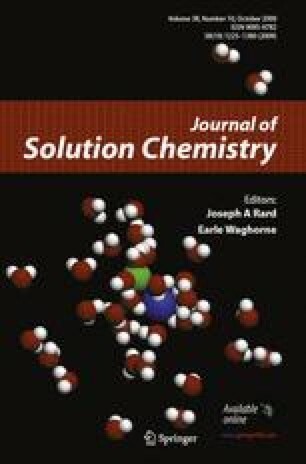 The solubility of industrially produced titanium dioxide nanoparticles has been studied in aqueous sodium chloride media in the pH range 1 to 13 at 25 °C by using adsorptive stripping voltammetry (AdSV). Kinetic dissolution curves have been obtained as well as long-term solubilities that provide an approximation of the equilibrium solubilities. The titania nanoparticles used in the dissolution experiments have been characterized by nitrogen sorption measurements, XRD and colloid titration. The equilibrium solubilities and titanium(IV) speciation and their dependences on pH have been modelled by assuming the formation of the mononuclear titanium hydroxo complexes [Ti(OH) n ](4−n)+ (n=2 to 5) to be the only titanium species present. The solubility product of titanium dioxide and equilibrium constants for titanium(IV) hydrolysis, calculated from the AdSV solubility data, are presented. The online version of this article ( 10.1007/s10953-009-9445-9) contains supplementary material, which is available to authorized users.